We've cleaned thousands of windows throughout New York City, and if there's one thing we've learned, it's that sparkling clean windows are a reflection on your business and ours. That's why we guarantee your satisfaction with every job. Our exceptional quality, dependability and service are unmatched. Window Cleaners NY is a locally owned and operated businesses. This means our owner-operators are your neighbors and members of your community, ensuring that you will receive personalized and professional service. From custom cleaning programs to detailed invoicing, we've made window cleaning hassle-free and cost-effective for business owners, property management firms and facility maintenance companies. Regardless of your budget, we can put together a program that meets your needs! For Window Cleaners NY, no job is too big or too small. Our uniformed professionals can handle everything from a local flower shop or apparel retailer to an office building or college campus. Whether we are visiting you twice a week or twice a year, you can rely on us to show up and do the job right. Our industry-leading premiere safety program ensures the protection of our customers and cleaners, and since we are bonded and insured, we provide peace of mind while maintaining and enhancing the appearance of your business. 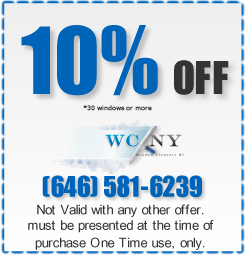 Let Window Cleaners NY Brighten Your World at work -- and at home too! Call today to have one of our commercial service experts give you a free on-site estimate. Even if you currently have a window cleaning service, Window Cleaners NY can provide competitive estimate pricing – you never know when you might need emergency services that cannot be provided by your current cleaner.